We bought our 66 at a Volunteers of America auction in 2004. We've been to every National Falcon Meet/Show since 2006 as well as numerous local southern Indiana shows and cruise-ins. Had the local high school body/paint class paint it Cadillac white & removed identifying insignia; changed naugahyde to cloth seats; built custom console; added AM/FM/CD. Came with air shocks, chrome wheels, chrome engine components. We enjoy having folks try to guess what we've got. as much of original Route 66 as possible from Chicago to Santa Monica. Pacific Coast Highway from San Diego to San Francisco. U.S. 50 from coast to coast. U.S. 41 from Fort Myers to Evansville. U.S. 52 from Indianapolis to Kankakee; U.S. 45 to U.S. 12 and on to Minneapolis. Various roads/highways/interstates from Mitchell, IN, to Gatlingburg, TN; Asheville, NC; Columbia, SC; Charleston, SC; Savannah, GA; St. Mary's, FL, Jacksonville, FL; east coast of FL to Fort Pierce; Fort Myers, FL; Tampa, FL; Gainesville, FL; Tallahassee, FL; Dothan, AL; Huntsville, AL, Nashville, TN and back to Mitchell. We drive our 66 every possible day. Wear it out; use it up? Maybe, but we get to enjoy the ride. Nice Job, and glad you are enjoying her. 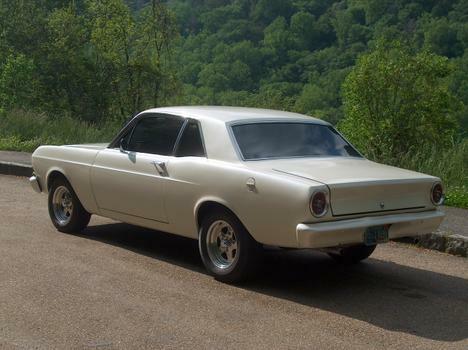 We have a 66 Falcon Sports Coupe w/302 B/P Boss. Plan to restore her after new house project done. Still looking for Engine Dress up's. What a go getter. Had her for few decades. Thank you. The 2011 National Falcon Meet is in Steamboat Springs, CO, July 14-16. The 2012 meet is in Louisville, KY, July 12-14. Bring your Falcon and have a great time. My first car was a 67 falcon sport. It was red with white painted top. I built up the 289 and put a 4spd in it. Too bad it was totalled when a lady in F350 rear ended me. The only good thing about that is you're able to talk about it. Come to Louisville on the July 12-14 weekend for the 2012 Falcon National Car Show/Meeting.